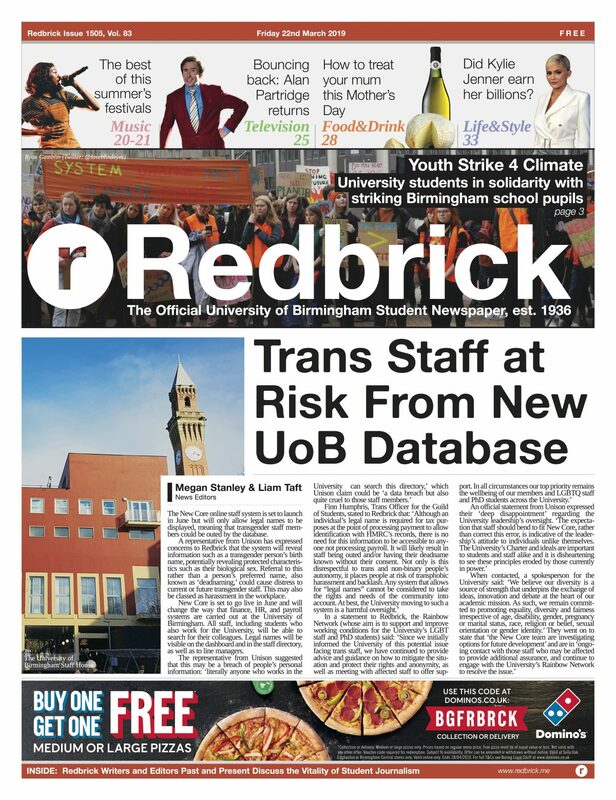 Considering Falafel Munch is notorious amongst vegan students living in Selly, for the combination of amazing prices and delicious flavour, it was a shock to most when another vegan takeaway opened literally two doors down. 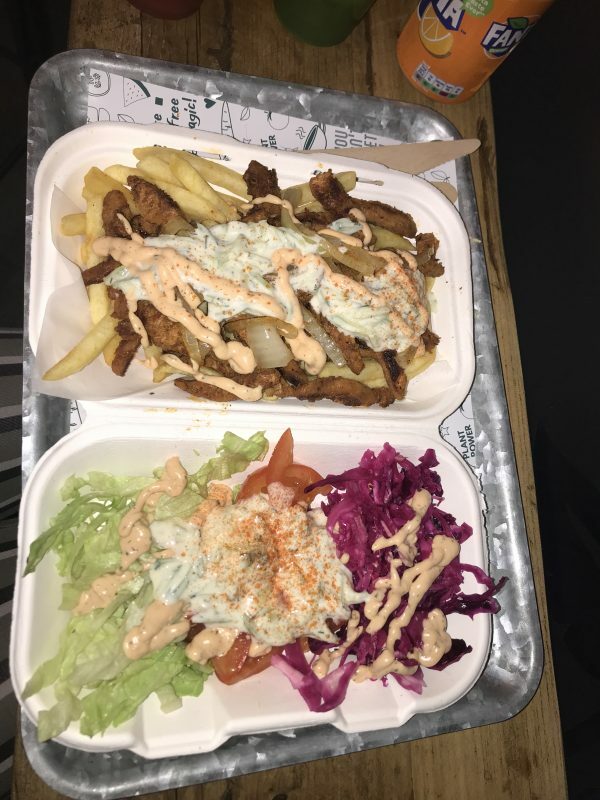 Vegan Munch, (with an eerily similar name to its neighbour), is owned by the same management as Falafel Munch and provides plant-based versions of classic favourites, such as Donner kebab and Chicken shawarma. For those like myself who follow a plant-based diet and therefore cannot partake in a post-pub Roosters, you will understand the genuine excitement in the opening of a fast-food restaurant that is 100% vegan. Little encouragement was needed to get me out of the house and onto Bristol Road, as I came to the enticingly bright green entrance of this eatery, with anticipation and an empty stomach. The location of Vegan Munch is extremely handy as it sits directly opposite Aldi, and therefore can attract anyone walking down Bristol Road. Branded from the get-go, as completely animal-free, you’re welcomed in to a smart, wood-based, earthy, interior that encourages diners to sit in with their food, which is no more expensive and always appealing when you’re invited to stay. An immediate glance at the menu shows it is focused around three versions of a soya-based meat substitute: ‘Donner,’ ‘Chicken’ and ‘Lamb.’ After a conversation with the extremely friendly owner, I quickly learnt that Vegan Munch achieves this by flavouring the same substitute with three, separate combinations of herbs- creating three completely different final products. It was revolutionary and commendable that they did all taste completely different, considering they have the same ingredient basis. Although the menu is based around these three products, there is surprising amount of options to choose from, allowing you to get any ‘meat’ option in a wrap form or on a bed of chips, alongside salad and your choice of sauce. Having brought a meat-eating friend for a variety of opinion, we opted for a ‘Chicken Shawarma Wrap’ and a ‘Donner Kebab;’ also trying the ‘Hummus Shawarma’ with lamb. The kebab came first, and visually I was extremely impressed. Individually, the substitute ‘meat’ appeared slightly different to regular donner meat; but once topped with tzatziki, salad and ‘special sauce,’ you really would never know the difference. The flavour was delicious, and I have to say this came to closest to tasting like the real deal. The ‘Chicken Shawarma’ looked just like chicken, and both my friend and I agreed the texture was uncannily similar too. The flavour was not as close to the original, but this did not mean it was not delicious in its own right. Considering our most expensive dish was £5.99, the portion sizes were extremely generous, making it exceptionally good value for money. With our mains tried and tested, we moved onto the side of ‘Hummus Shawarma’ with the lamb accompaniment. What was remarkable, was the difference in appearance in all three options, as the lamb option arrived looking very different to our previous choices. For me this showed effort and dedication to what Vegan Munch have branded, as they have clearly endeavoured to try to recreate three different meats, committing themselves to the agenda that vegan never means limiting! It tasted aromatic, flavourful, and once again, very different to the others (with a slightly softer texture), although for me this was the option that was the least similar to its intended meat. This does not detract from the fact that both I, (a plant based customer) and my friend, (a meat-eating customer), thoroughly enjoyed all the options. If that does not tempt you enough, then an entire page dedicated to freshly squeezed juices should cut it. Clearly presenting itself as a healthier alternative to takeaway foods, Vegan Munch stands as proof that fast-food eateries can offer healthier options that are delicious, filling and affordable. We tried the ‘Chamander’ and the ‘Zucchini Energia’, but I genuinely could have picked any option, they all sounded so fresh and tasted utterly delicious. 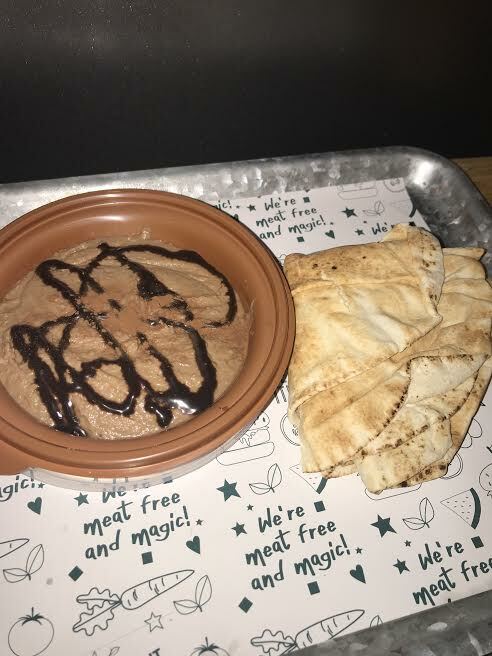 With my stomach almost full, the only thing left to try was perhaps the most controversial item on the menu – Chocolate Hummus. Extremely apprehensive, I dipped my pitta into this chocolatey treat, completely unsure of what to expect. However, I was pleasantly surprised at how sweet the hummus actually was, tasting more like a pudding than a traditional hummus. The consistency was similar to what you would expect, but the flavour was subtle, sugary, and overall, pleasant. Although I personally wouldn’t choose to have it, any avid chickpea fans I am sure would relish in this hummus-based novelty. Over-all I’m extremely impressed. Vegan Munch achieve everything they brand themselves as, and more. It is plant-based, fresh, delicious food that I would recommend to anyone regardless of their dietary choices. All you need is large appetite and a loose pair of trousers in order to get munching. Thank you Vegan Munch for having us!